As any experienced investigative reporter knows, the first tenet of uncovering corruption in public “officialdom” is “Follow the Money.” That dictum applies equally well to separating Clark County sheriff candidate(s), who have been bought and paid for by the Las Vegas “Cartel of Corruption,” from those who would break the Cartel’s hold on Southern Nevada and clean up a demoralized, broken police department. By law, Sheriff candidates are required to file periodic Campaign Contributions and Expenses Reports with the State of Nevada. These provide at least a smidgen of insight into who is backing which candidate, and who’s writing sizable checks that normally ensure their guy pins on the sheriff’s badge. The most recent reports are telling. As of Jan. 14, 2014, candidate Joe Lombardo reported a campaign war chest totaling $503,900. Front-runner challengers Larry Burns and Ted Moody are well behind, but still attracting noteworthy donations. The key question voters should be asking is: From whom are those donations coming? And what has been promised in return? • All but one of Joe Lombardo’s heavy-hitter donors forked over MORE than $100; most were in the $5,000-10,000 range. Who was the sole $100 check-writer? Joe, himself. • Why would Santa Fe Station, Red Rock, Green Valley Ranch, Boulder Station, Palace Station, Golden Gaming, Konami Gaming, Boyd Gaming and Mesquite Gaming hotel-casino-resorts each give Lombardo $10,000, the maximum allowed? • Other gaming companies and hotel-casinos popped for $5,000 each, including Caesars Entertainment Operating Company, Edgewater, Colorado Belle, Sugar Factory and South Point. • Among TV, movie and entertainment big donors, three members of the Maloof family coughed up a total of $20,000 for Joe. Ultimate Fighting Productions, Sunrise Productions and Langley Productions each gave $10,000. Could they be buying access for “Cops” and other TV “reality” shows? Surely not! • A batch of corporations signed $10,000 checks to Lombardo. These include Murphy Electric and Murphy Electric Pools ($10,000 each); Lucca Real Property; R&S Leasing, and Southern Highlands Marketplace. Taxi and “cab” companies poured thousands more into his campaign chest. • A virtual alphabet soup of nontransparent entities ponied up $5,000-10,000 for their friend, Joe: KMB LLC; Zuffa LLC; Forza LLC; Territory, Inc.; PT Corp.; HH Holdings LLC; Jam III LLC; CJGAGP LLC; SWG, Inc., Duffers LLC and SW Golf Reservations LLC. • Well-heeled individuals and trusts also signed over tens of thousands to support Lombardo. • Interestingly, former Clark County sheriff Bill Young pried $2,500 from his healthy Station Casinos paycheck to support his fellow lawman. • Media and public relations “king makers,” such as The Rogich Communications Group ($5,000) and F&M Advertising ($5,000), are solidly aligned with Lombardo. • Why would Motorola Solutions give $5,000 to Joe’s campaign? Could a new police department communications system be earmarked for any particular company? • How many of these groups, companies and individuals are fronts for a handful of gaming-industry barons, who are funneling blatantly illegal contributions to their anointed candidate? Only those inside the Cartel know for sure. Thanks to a long string of sheriffs, who sold their honor and souls to ensure billions of dollars continued to pour into specific coffers, Strip mega-millionaires and Las Vegas underworld power brokers have been assured Metro’s relatively small cadre of killer-cops and low-IQ goons will get rid of bodies and “take care of business,” when dictated by the Cartel of Corruption. These same moneyed elites apparently have been assured Joe Lombardo will continue to serve their interests without question. Hence, they’ve written big checks to his campaign. Within the next few weeks, Las Vegas-area citizens will be barraged by TV, radio and newspaper ads urging them to vote for Joe Lombardo. His face and vacuous promises to “stay the course” will dominate screens and air waves, because he’s the only candidate with enough money to buy expensive advertising. Smart citizens will see that for what it is, though: Gaming money and powerful king-makers buying votes. Falling for fancy, high-dollar advertising blitzes is a guaranteed path to keeping badly screened, poorly trained, excessively paid, arrogant Metro cops on the street to shoot and kill innocent “civilians.” That’s what the big-money candidate—the man who guarantees Doug Gillespie’s gutless “leadership” practices will continue—has promised. Finally, it’s time Clark County citizens face up to a hard, unpleasant economic truth: Electing the wrong man as sheriff will put YOUR job at risk. What the Strip’s big-money magnates know acutely well, but are refusing to tell Clark County citizens, is this: The world is no longer going to Las Vegas for fun and gambling. 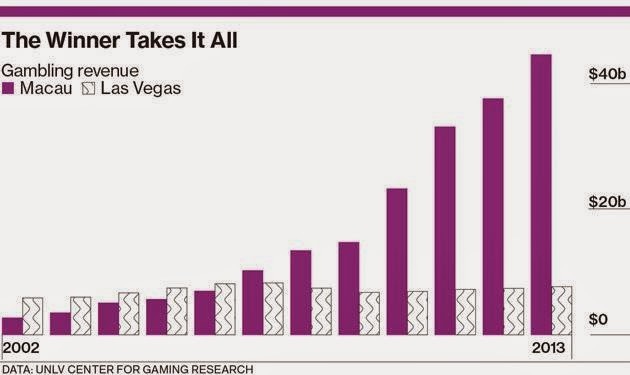 Gaming revenues in Macau, China, now far exceed those of Las Vegas. Macau’s revenue continues to climb at astronomical rates, while that of Las Vegas is flat (Figure 1). One unmistakable reason is Las Vegas Metro PD. Americans and foreign would-be visitors have heard that Metro cops are trigger-happy and kill at rates far above other cities. Thousands of people now are afraid to visit or live in Las Vegas. Millions of dollars being spent by the Las Vegas Visitor and Convention gurus to lure visitors and new residents can’t overcome the flood of negative publicity incurred by Las Vegas Metro’s egregious, senseless shootings of Trevon Cole, my son, Erik Scott, Stanley Gibson, Tanner Chamberlain and dozens of other innocent victims. Yes, the moneyed elites of Vegas are pouring thousands of dollars into one candidate’s campaign, hoping against hope that advertising noise will somehow overshadow perceptions that Las Vegas is a rotten, corrupt and dangerous town. But it’s too late. The word is out, and it’s spreading like wildfire across America, Asia and Europe: Vegas cops kill and abuse. If you want to keep your job, and if you want your city to prosper again, cast your vote for The Right Sheriff. Only he will take the difficult, necessary steps to clean up Metro and destroy the cancer of “officialdom” that is decimating your city and county. The only way those visitor numbers will return to “normal” is to destroy the Cartel of Corruption and sweep lawbreakers from public office.